In August, Chase made waves in the points and miles world with the introduction of a fantastic new product: the Chase Sapphire Reserve Card. The card is currently offering a sign-up bonus of 100,000 Ultimate Rewards points after you spend $4,000 on purchases in the first three months from account opening. This sign-up bonus is worth at least $1,500 when you redeem the points directly for travel, but you can maximize those points by transferring them to partners like United and Hyatt. Today I’ll kick off a new series that highlights how this sign-up bonus can get you to popular destinations around the world. Our first subject: the island paradise of Hawaii. Hawaii is a popular destination for award travel, and the Sapphire Reserve can help get you there. Image courtesy of Shutterstock. Before getting into specifics of how you can get to the Aloha State, a quick overview of how I’ll approach this series. For starters, I’ll be looking primarily at transferring these points to partners as opposed to booking travel directly. This tends to be where you can get outsized value from your Ultimate Rewards points. In addition, I’ll assume that you spent $3,000 on travel and dining purchases and $1,000 on everyday purchases to meet the minimum spending required for the sign-up bonus. This will leave you with 110,000 Ultimate Rewards points. Keep in mind too that these suggestions only apply to a single individual opening the Sapphire Reserve. If you’re looking to travel with a spouse, significant other or family member, it could make sense for you both to open the card. There’s also the Chase Sapphire Preferred Card, which can further boost your Ultimate Rewards account balance, and there are many other credit cards that can further enhance your trip. I’ll try to highlight those options where they apply, though keep in mind Chase’s 5/24 rule as you plan out your card application strategy. With that all out of the way, let’s take a look at how the Chase Sapphire Reserve can get you to Hawaii! Alaska has an extensive route network to Hawaii from multiple West Coast cities, all bookable using British Airways Avios. Unfortunately only American flights will show on the British Airways search engine, so you’ll need to call in order to book an award ticket on Alaska. I’d strongly encourage you to use ExpertFlyer to search award inventory (or even set alerts) ahead of time so you’ll know when flights are available. Transferring points to Korean allows you to book round-trip award tickets on Delta flights to Hawaii. Another option for getting award flights to Hawaii is transferring Ultimate Rewards points to Korean Air’s SKYPASS program. While the award-booking process is a bit convoluted, there are some really solid values on the award chart. Korean classifies Hawaii as part of North America on its Sky Team award chart, so a round-trip flight on Delta from anywhere in the US to Hawaii is just 25,000 miles round-trip. You can also book a round-trip flight in first class for just 45,000 miles. Of course, you must find low-level availability on Delta and then go through the aforementioned booking process, something that’s even harder now that Delta no longer publishes award charts. Note that Korean also partners with Alaska, but you’ll need to spend 30,000 miles on a round-trip coach ticket from the US, so you’d save 5,000 miles booking those same flights through British Airways. You also have the option of booking award tickets on Hawaiian Airlines with SKYPASS miles, though you’d again need to fork over 30,000 miles for a round-trip coach ticket. Nevertheless, it’s nice to have alternate options if Delta doesn’t have award inventory on your desired dates or routes. A third option for reaching Hawaii would be for those of you looking to book flights on United. The carrier offers nonstop service to the Hawaiian islands from all of its major hubs, including Newark (EWR), Washington-Dulles (IAD) and Chicago-O’Hare (ORD). However, to book these flights, you actually don’t want to transfer your Ultimate Rewards points to United. You instead should transfer them to Singapore’s KrisFlyer program, United’s Star Alliance partner. Singapore only charges 35,000 miles for round-trip economy award tickets, while the exact same flights booked through United’s MileagePlus program would set you back 45,000 miles. As you can see, the Ultimate Rewards program gives you many options for transferring points to partners that then allow redemptions on flights to Hawaii. Note that none of these carriers actually offer flights on their own planes. This is why knowing how to book awards using partner programs is key. The four-tiered main pool area of the Andaz Maui, bookable using Ultimate Rewards points (if you can find availability!). I stayed at the Andaz Maui in May and had a decent experience, but you’ll want to be sure that the resort has availability on your desired dates, as it’s been known to play games with award inventory. Many of the other properties might not be as luxurious but still give you a great option for free nights in paradise. Keep in mind too that you can also look for Hyatt’s Points + Cash award option, a particularly good value at the Category 5 and 6 properties above (especially seeing as though you can still use Diamond Suite Upgrades on these stays). The Kaua’i Marriott Resort is one of more than a dozen Marriott resorts across the islands of Hawaii and could be a great option for an award stay using the sign-up bonus from the Sapphire Reserve. Image courtesy of the hotel. Another option for award stays in Hawaii is through Marriott Rewards. Unfortunately, the most inexpensive property is the Category 6 Courtyard King Kamehameha’s Kona Beach Hotel, which will set you back 30,000 points per night (25,000 points if you can find PointSavers inventory). The program then has numerous Category 7 and 8 properties as well, though you’ll spend more points (35,000 and 40,000, respectively) for free nights at these resorts. However, as with Hyatt, you do have Cash + Points awards to utilize, and the program also allows you to make award reservations even when you’re short on points. This can allow you to lock in a pricier redemption for a stay way into the future and then build up your Ultimate Rewards (or Marriott Rewards) balance leading up to the stay. The Sapphire Reserve is a great option if you’re looking to redeem points for a Hawaiian vacation. Hawaii is one of the most sought-after destination when it comes to redeeming airline miles and hotel points, and for good reason. Unfortunately, this popularity can hinder award availability, so if you’re relying on a single carrier and hotel chain, you may be out of luck. This is one of the main reasons why it’s critical for all travelers to have transferable points. Hopefully this post has given you some strategies for planning your trip to Hawaii if you’re a proud new holder of the Sapphire Reserve! 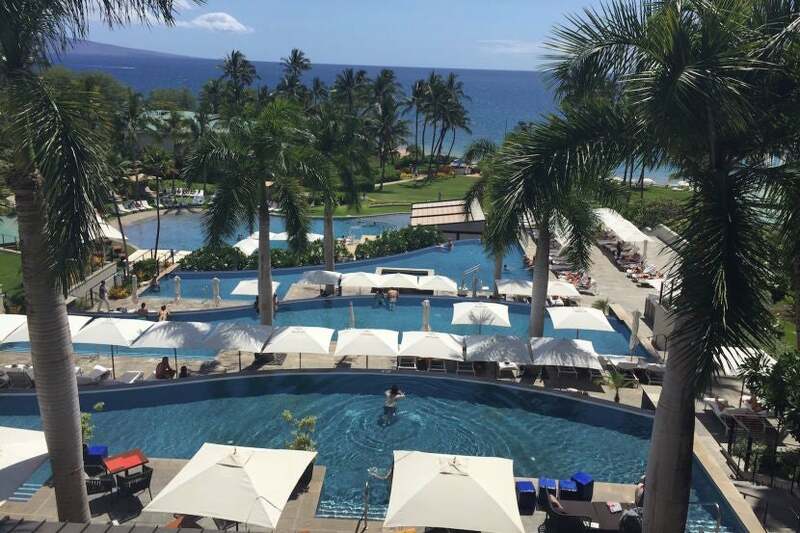 How would you book a Hawaiian vacation using the points from the Sapphire Reserve?